A.S.Controls was established in 1986, and started out as a small unit that developed level controls and valves for ammonia plants. Today we take pride in our technical innovation that puts us in the forefront of the refrigeration and air-conditioning control industry in India. 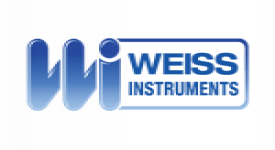 We have two established brands – Castle and Subzero, both of them have grabbed the attention, and the loyalty of several industry giants like Blue Star, Kirloskar , Reliance and others. Our strength comes from industry experience, and more importantly, our in-house R&amp;D team that works round the clock to keep us ahead. Each brand has its own core technical team, and borrows specific talents from a common pool. Our approach to everything is lean and efficient. Which is how we manage to run a successful R&amp;D team, core technical team, marketing staff, production, administration all with a low head count. 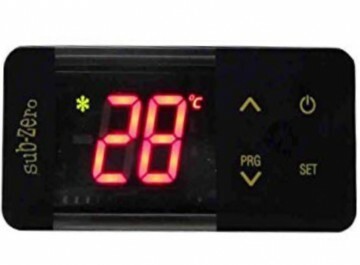 Cooling and Heating output. Memory retention, time delay for compressor protection. Auto operation in case of sensor error. Power switch. Temperature range -50°C to +99°C. 230VAC Standard. Other models with 12VDC, 24VDC, 110VAC on request. Panel cutout : 29 X 71 mm Screw terminals : Admit 1X 2.5 mm² wire. Spade terminals for compressors (For SZ – 7569 – P only). General appliances like deep freezers, display cabinet, pastry cabinet, steam bath systems and chillers. Cooling and Heating output. Memory retention, time delay for compressor protection. Auto operation incase of sensor error. Power switch. Temperature range -50°C to +99°C. 230VAC Standard. Other models with 12VDC, 24VDC, 110VAC on request. Panel cutout : 29 X 71 mm Screw terminals : Admit 1X 2.5 mm² wire. Spade terminals for compressors (For SZ – 7569 – P only). General appliances like deep freezers, display cabinet, pastry cabinet, steam bath systems and chillers. 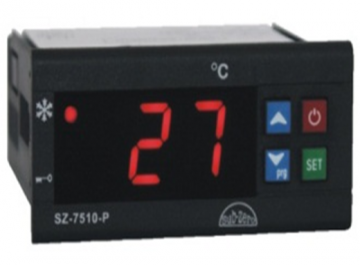 Digital temperature Indicator with 0.1°C resolution. Temp. 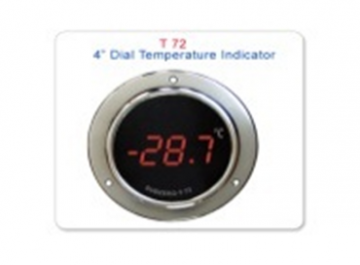 Sensor Input : 1 NTC.Cold room, general applications. Temperature range -50.0°C to +50.0°C. 230VAC Standard. Other models with 12VDC, 24VDC, 110VAC on request. Panel cutout : 105 X 105 mm. 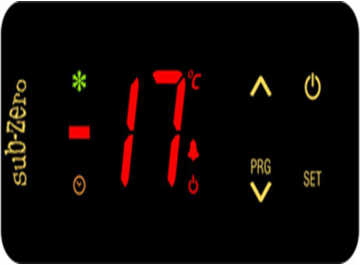 The controller controls the defrost in the system based on either an electrical heater where the compressor is stopped, or at cycle inversion using warm gas where the compressor keeps on working. There are safety features which include shutting down the system incase of a fault from a pressure control or similar device. A series of “safety controls” (delay at start-up, minimum disable time, minimum time between activation) protects the compressors from close starts. 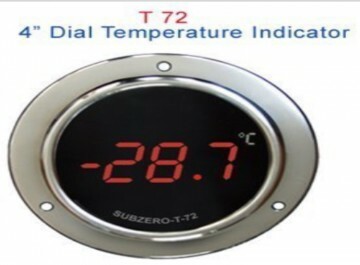 In case of probe error or temperature alarm, the instrument signals the event through acoustic signal and by closing the relay contact. By pressing the mute key, the buzzer is silenced. 3 NTC probes for Room temerature, Coil temperature, Condensor Temperature. 1 RH sensor with 4 – 20mA input for humidification. Contactor outputs : Compressor, Condensor, evaperator, Relay output : Liquid SV,Alarm, light and humidifier. HP,LP, Compressor O/L, SPP, Pump O/L, Auxiliary Fault trip protection for Compressor and defrost. 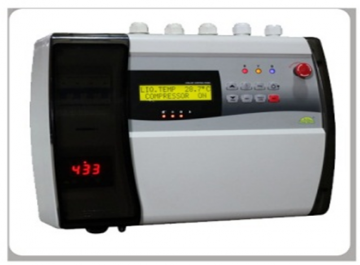 Auto/Manual reset for HP, LP and Compressor current sensing upto 20Amp. It also protects your compressor by tripping it in underload and overload conditions.